Silver Found Off Madagascar Thought To Be From Capt. Kidd's Treasure : The Two-Way The Scottish sea captain was hanged as a pirate in 1701. He is known to have sailed to the small island of Sainte Maire off Madagascar in 1698. A portrait of Capt. William Kidd at the Museum of London Docklands, in east London, shown in 2011. A 110-pound silver ingot thought to be from the treasure of Capt. William Kidd — the notorious 17th century Scottish pirate who was ultimately hanged for his misdeeds — has been brought up from the shallows off Madagascar's eastern coast. The discovery was made by the American underwater explorer Barry Clifford near the island of Sainte Marie, which itself lies just off Madagascar. 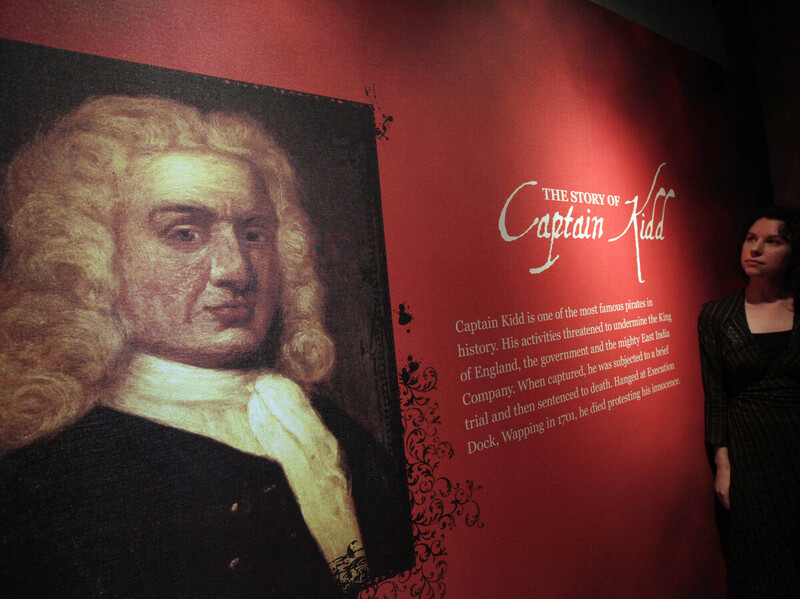 Kidd, who is known to have sailed to Sainte Marie, was executed in 1701 for piracy, and his body was "dipped in tar and hung by chains along the River Thames to serve as a warning to would-be pirates," according to The Telegraph. At the time of his capture, Kidd had just returned from plunder in the Indian Ocean. Even so, we should attach a cautionary "allegedly" around Kidd's piracy, as historians have noted that there's evidence the sailing master was unjustly tried and sentenced as he was in fact operating under a letter of marque, a legal document from the British government that designated him a privateer rather than a pirate. The Telegraph says that following the recent discovery, "Madagascar's president was presented with the suspected treasure at a ceremony on the island, also attended by UK and US diplomats." The BBC adds that "there is much excitement in Madagascar about the discovery and Mr Clifford's team has no doubt that the discovery is genuine. "The team believes the bar has its origins in 17th Century Bolivia and that the ship was built in England." In 2007, a wreck was discovered off the Dominican Republic in the Caribbean. The vessel is thought to be the Quedagh Merchant, an Armenian ship that was captured and commandeered by Kidd in 1698. In fact, it was the capture of the Quedagh Merchant, laden with gold, jewels, silver and silks, that may have sealed his reputation — and fate — as a pirate. According to Captainkidd.org: "The prize ... was a legal nightmare. Owned by Indians, carrying a Persian cargo, crewed by Moors, and with an English Captain named Wright. All sailed together, allegedly under a French Pass. Kidd had to decide if this was a legitimate prize. The Pass was the key to the answer, and upon which hinged the outcome of his eventual trial. Kidd decided she was a legitimate prize and hoisted his English flag over her quarterdeck."